Implant dentistry is the most advanced therapy available to replace missing teeth. Dental implant restorations generally look, feel, and act like natural teeth. Dental implants may offer you important advantages compared to other treatment options. Improved health and enhanced appearance may both lead to greater self-confidence and a better quality of life. Ask us today if you are a candidate for dental implants. Dental implants are designed to be a long-lasting solution for tooth loss and are cared for with brushing and flossing, just like natural teeth. Caring for non-implant tooth replacements can be much less convenient compared to implant-supported teeth. 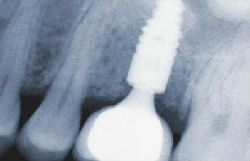 Dental implants also eliminate the need to use messy dental adhesive. ANKYLOS C/X implants have a unique tapered connection to enhance stability and prevent microbial infection on the tissue. When a tooth is lost, the surrounding bone begins to shrink away or resorb and becomes increasingly brittle, compromising adjacent teeth and increasing the chance of a changed appearance. Non-implant supported dentures, such as partials or bridges, may actually accelerate this process. Dental implants may help to prevent or slow bone resorption, helping to preserve your natural facial contours. What Is Single Tooth Replacement? Teeth can be lost for a number of reasons, including cavities, periodontal disease, or trauma. Did you know that by age 17, more than 7.3 percent of U.S. children have lost one permanent tooth; and by age 50, Americans have lost an average of 12 teeth? If you are missing one tooth in a given area of your mouth, we may recommend that you consider one dental implant to replace the root of the missing tooth, and an implant crown to rebuild your tooth in a beautiful and natural-looking manner. Compared to other treatment options to replace missing teeth, such as bridges and removable partials, an implant with an implant crown offers a long-lasting solution for a missing tooth and requires fewer follow-up office visits. Did you know that oral health is a major factor of good general health? Replacing your missing tooth with a dental implant and an implant crown should allow you to live your life as if you had never suffered from a missing tooth. When your treatment is complete, you should be able to chew, speak and socialize without experiencing the negative emotions that having a missing tooth can sometimes cause. Also, a dental implant and implant crown will help minimize the amount of bone that will be lost in the area of the missing tooth. Preserving oral bone may help maintain your remaining natural teeth and natural facial contours. Replacing your missing tooth may reduce the risk of having poorer nutritional habits often found in patients who do not replace missing teeth. Note that is is still aligned perfectly in position. Am I A Candidate For A Dental Implant And An Implant Crown? Only after close evaluation can we say for sure, but most patients can be treated with dental implants. We will want to evaluate you carefully with an examination and x-rays and will make specific recommendations to you about the best treatment to replace your missing teeth. Ask us for more information on how you might benefit from a dental implant and a dental implant crown.